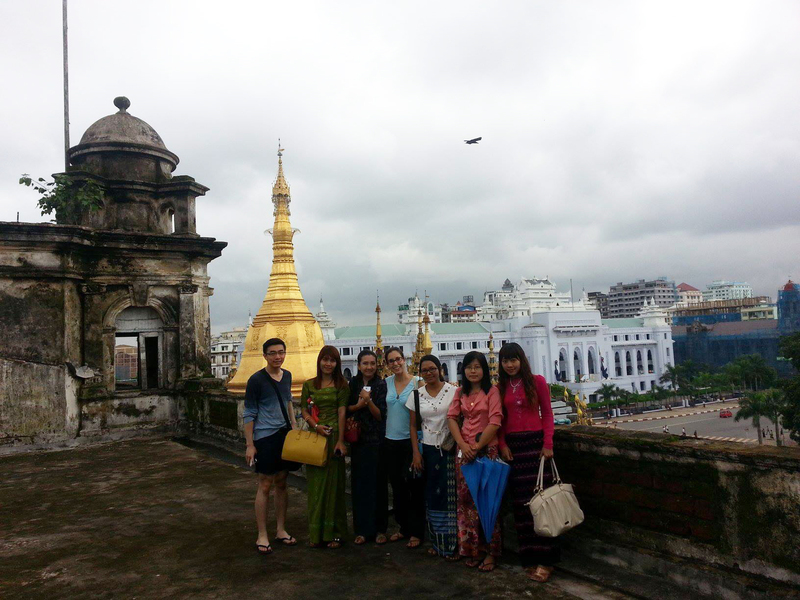 My internship at the Yangon Heritage Trust (YHT), in Yangon, Myanmar (Burma), was a tremendously rewarding experience. I interned there from May 27th to Aug 7th for a period of 11 weeks. Yangon Heritage Trust was founded in 2012 by historians, architects and planners who came together to preserve Yangon heritages. Since Burma is undergoing political reforms recently and opening up to the world, these heritages are under huge threat from the interest and pressures of new investments and new development projects. Damaged by many small developers and big developers alike in the city during the last two decades under military-regime without proper preservation and planning regulatory controls, the city now needs desperate measures to stop the untamed rampage on historic fabric and streetscapes of the city. Once a colonial capital for British-Burma since 1850s, Rangoon (now Yangon) was a metropolitan city of South East Asia and boasted as one of the most beautiful cities in Asia. 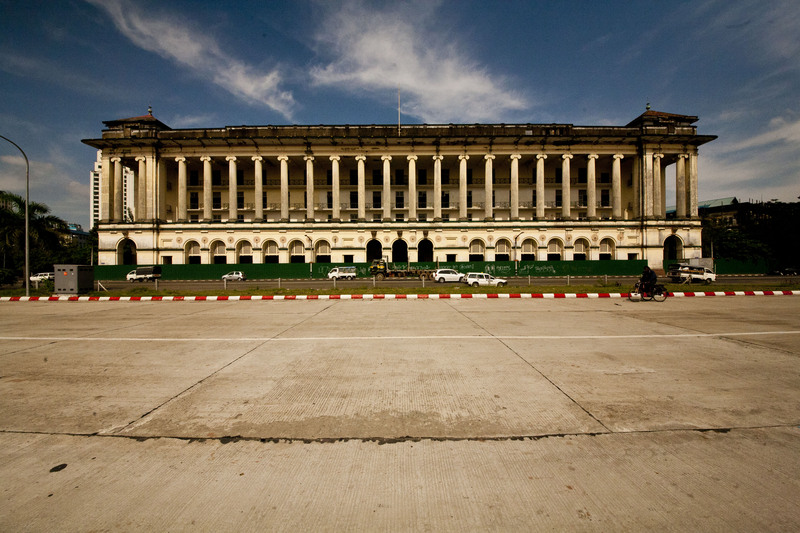 It remained as the capital of independent Burma until 2005 when the military regime moved some 230 miles north to a new capital and left many government buildings empty and without uses. 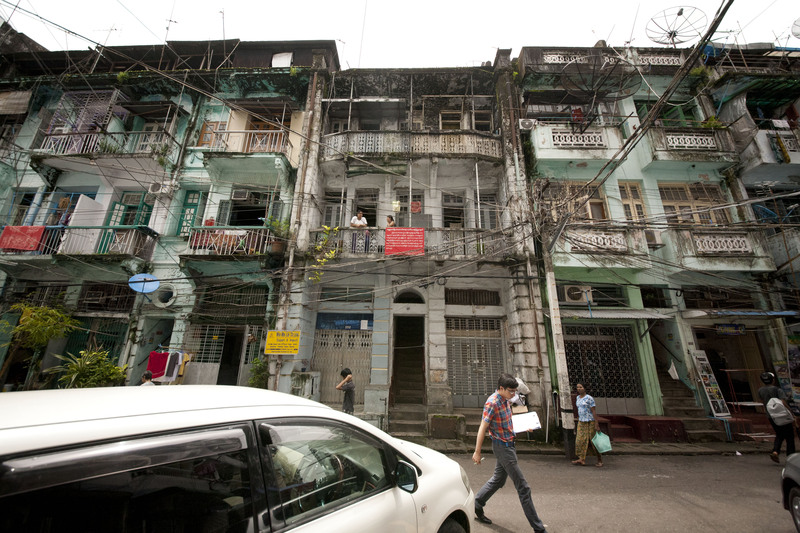 Yangon is plagued by deteriorated and dilapidated colonial structures, many without proper maintenance. 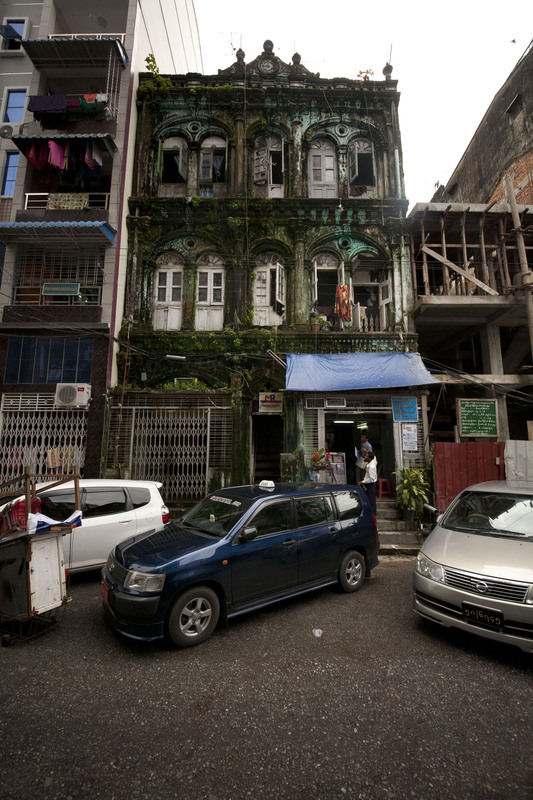 Trees are growing from the buildings and mosses are overrunning the facades. Trashes fill up in the courtyards of historic buildings due to the lack of municipal services and on the other hand, the lack of disciplines by the city-dwellers. It presents an enormous challenge to the city in preserving these historic buildings. YHT not only advocates for the protection and preservation of these heritages but also works very closely with Yangon City Development Committee (YCDC), the municipal authority, Yangon Region Government and Union-level authority from different ministries to the President’s office, in formulating heritage policies and plans for this historic city. My key work assignments were inventory work of heritage buildings and preservation law for Yangon but I also had to work on other impromptu tasks from creating brochures and posters to attending meetings and forums since the office was low on staff and expertise. Inventory work is naturally the first step in formulating heritage policies that YHT advocates for and it is instrumental in understanding the current situation of the city. I worked on two townships in the central business district (CBD), the historic core of the city, namely Latha and Kyauktada. Latha Township consists mainly of Chinese-Burmese community with Chinese shop-house architecture dominating the character of this area. With over 400 potential heritage buildings, there is a great potential to create a historic district. Due to limited information and lost archives during the war and successive governments, (at times, unwillingness of the city government to share historical records), we mainly looked at architectural features and styles in choosing them as heritage buildings. We are fully aware that more holistic architectural, social and political aspects must be further explored in the future. Since photographic documentation was already done, I was mainly filling out inventory forms for each building with the inventory team. Kyauktada Township was the administrative core since the colonial times. Many grand colonial buildings are still defining the character of this township. The High court, the City Hall, the grand department stores of early 1900s, the large bank buildings of various architecture styles, beautiful late 19th century and early 20th century apartment buildings, churches, temples, mosques, are all concentrated most in this township. For this township, I worked with Rupert Mann, another volunteer from Australia who is working on his master’s degree in heritage, in taking photographic documentation and mapping of every single building, block by block of this 52-block township that has over 1000 buildings, potentially having more than 500 heritage buildings. It was the way to know the city better. I grew up in this neighborhood but never realized the richness of it before. I would not have walked every corner of this township if I were not doing the inventory work and I probably would not know the immense architectural treasures it possesses until now. 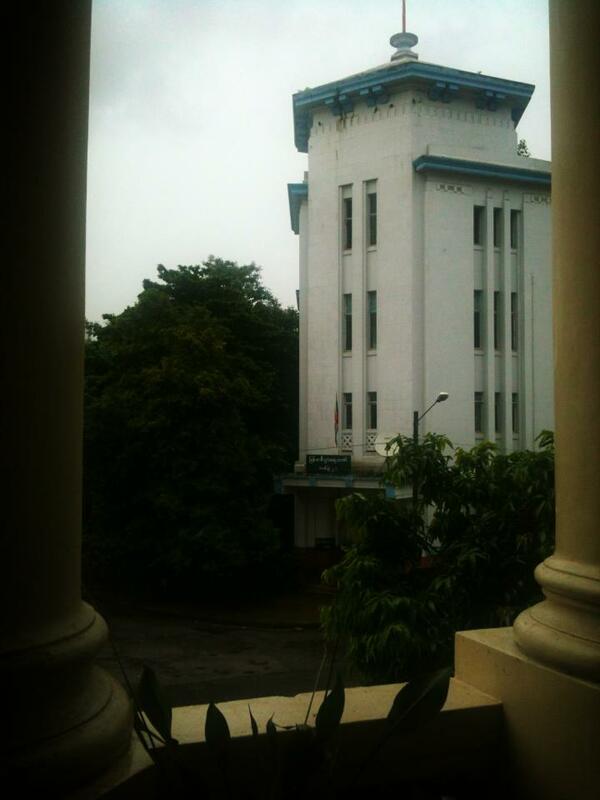 Former Chartered Bank (seen from YHT office), built in 1941 by Architects Palmer & Turner, is seen from YHT office. 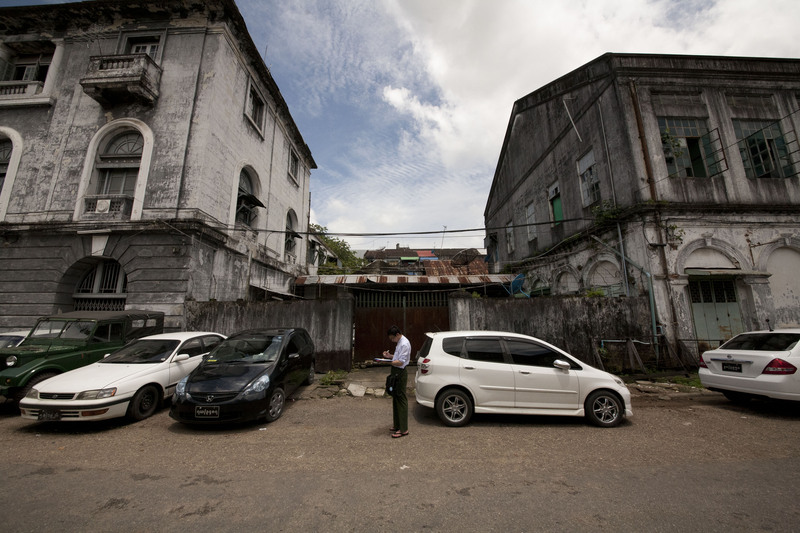 “A year after completion, the bank had to abandon it when Japanese army marched on Yangon in WWII. By Jan 1942, well-prepared bank staff had duplicated records and requested permission to ship to Calcutta. A month later, its staff, cash, bullion were loaded onto a train for evacuation to Mandalay. 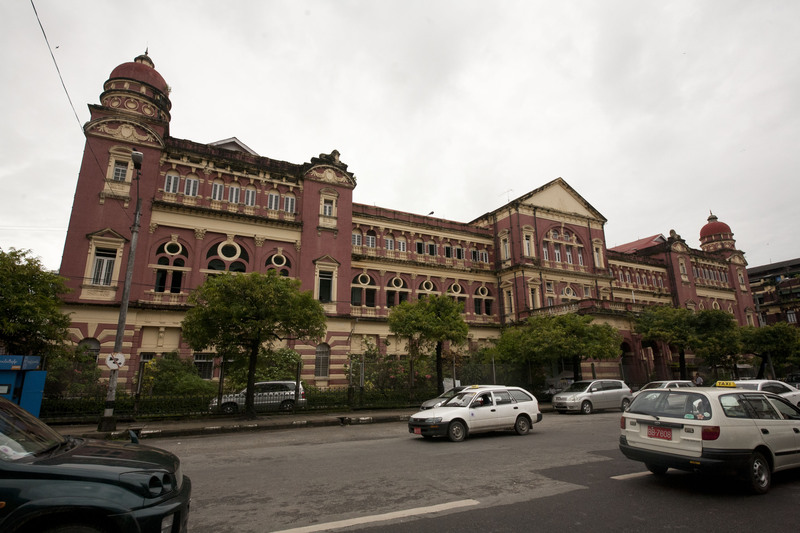 It was spared by bombings and Chartered bank returned in 1945.” Now that Burma is reopening, Standard and Chartered Bank would like to re-claim the building and is in discussion with Myanmar Government. There are four more townships in the CBD which have many heritage buildings and YHT is working on these as well. We have hired photographers to document these four townships and the photos are now being sorted out at the office. The time is running out and we are pressing hard to get the rough inventory work done within the next few months. As a stop-gap measure, YHT is recommending YCDC to stop the demolishing of buildings older than 50 years, with understanding between YHT and the authority that the developer will now require the recommendation of YHT first before applying for permits from YCDC to demolish them. At the same time, YHT faces the practicality of conservation of these thousands of buildings where many low-income families live. They are vulnerable to irresponsible developers who offer the families new “modern” building with extra profits as they tear down heritage buildings and build cheaper and taller apartments, most of the time, inconsistent with the character of the city and the surroundings. With focus on heritage as a mean to revitalize downtown Yangon and conservation-led development strategy, YHT is working hard in explaining the public and the government officials to understand the economic potential of tourism and businesses that these heritages can bring and to create a livable city for its residents while preserving the rich layers of history that are not only significant to the city and the country but the region. Thus, the inventory work is very important and it will shape the future development plans of the city. During the historic visit of President Obama in Burma last November, he said that Yangon reminded him of his childhood in Indonesia but when he visited Indonesia, he did not feel the same anymore because so much had been lost there that Yangon must learn from others’ mistakes to preserve its history and the cityscape. He asked Mr. Derek Mitchell, the American Ambassador to Burma to help in this field and as a result, Regional Plan Association (New York) went to Yangon last month for a reconnaissance visit funded by Rockefeller foundation. Many organizations from WMF to Getty Institute are looking into helping Yangon as well. It is definitely an exciting time to be in Yangon and to help in a good cause in Asia. If you are interested, visit www.yangonheritagetrust.org and find out more on the history of the city and what the media are talking about Yangon and Myanmar. The preservation movement of urban heritages just kicked off in Burma within the last year and I am very happy and humbled to be part of this. I could not thank enough to Dr. Thant Myint-U (grandson of former UN Secretary-General U Thant, chairman of YHT) and Daw Moe Moe Lwin (director of YHT) for giving me the opportunity to work with them. I learned a lot from the internship since I could work with much independence in the organization. I will continue to follow the development of YHT and preservation scene in Yangon, and will be helping with anything that I could from abroad. This is amazing ZLM. I remember our heritage walk in high school with Daw Moe Moe Lwin. It’s so heartwarming to know you have come so far in a matter of six years and the same goes for the country. Keep up the good work! In Yangon to see Sofaer’s Building and other traces of my husband’s family business and the stories they told about life in early twentieth century Rangoon, I found your report by searching for “Burmese Favorite Department Store.” Thank you for contribution to the important work of Yangon Heritage Trust. Hope the law passes before more buildings are demolished.